Speech and language skills are vital for social and academic competence. Early detection and intervention are key to ensuring children receive the help they need to achieve academic success and maintain successful relationships. That’s why the Southern Illinois University Edwardsville’s Speech-Language-Hearing (SLH) Center, housed in the School of Education, Health and Human Behavior, is bringing its screening resources into the community to benefit preschool and school-age children. The SLH Center’s latest community partnership brought speech-language pathology graduate student clinicians to Metro East Montessori School (MEMS) in Granite City for a five-day screening event that included primary and elementary students. Henderson notes that screenings do not diagnose a disorder. Rather they help identify children who may need further assessment. Early detection and intervention, through screenings, promote treatment when needed to improve quality of life and allow students to enjoy all the benefits of their educational experience. Not only do the SLH Center’s screening events benefit community members, but also SIUE speech-language pathology graduate students are gaining real-world clinical experience. “Getting to work at the on-campus clinic and at community events, such as Metro East Montessori School, offer us a richer, hands-on type of learning,” said Maren Valyo, a speech-language pathology graduate student from Alton. SIUE’s speech-language pathology graduate students complete three externships during their studies, including a medical placement, a school placement and a third placement in a setting of their choice. 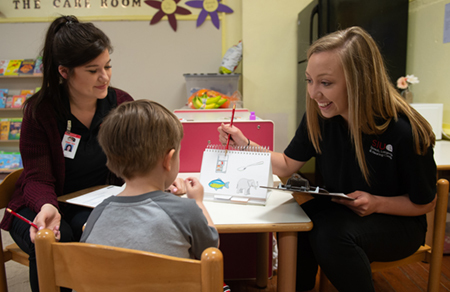 The SIUE graduate program in speech-language pathology is accredited by the Council of Academic Accreditation in Audiology and Speech-Language Pathology of the American Speech-Language-Hearing Association. For more information on program, and specifically the SIUE SLH Center, visit siue.edu/slh-center/index. Photo: SIUE speech-language pathology graduate students Maren Valyo (left) and Hannah Greeling (right) lead a speech and language screening with a child at the Metro East Montessori School.